It’s a “router-on-a-stick” configuration. Which means each host in the VLAN must corresponds with the VLAN configured on the sub-interfaces. VLAN 10 is configured on fa0/0.10 and VLAN 20 on fa0/0.20. 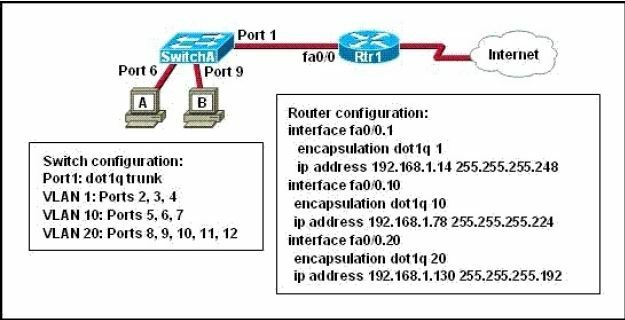 So each hosts in VLAN 10 must use fa0/0.10 IP address as their default gateway, each hosts must also be in the same subnet as fa0/0.10 IP – same with hosts in VLAN 20. So find out the usable IP addresses on each sub-interfaces – for 192.168.1.78 /27: 192.168.1.65 – .94 and for 192.168.1.130 /26: 192.168.1.128 – .190. Host A (using port 6 – VLAN 10) must use IP 192.168.1.79, default gateway 192.168.1.78. Host B (using port 9 – VLAN 20) must use IP 192.168.1.190, default gateway 192.168.1.130.